Eggplant Manager is a test management system that lets you manage your Eggplant Functional suites, define tests, schedule test runs, and analyze results all in one central location: Your web browser. Eggplant Manager provides you with the easiest way to run multiple tests or instances of a test simultaneously against different devices. In addition to running Eggplant Functional scripts, you can use Eggplant Manager to run Eggplant Functional schedules, keyword-driven tests, Gherkin tests, API tests, and executable files using shell functionality. This video describes the basic Eggplant Manager concepts. The following list of basic concepts explains what you need to know to work with Eggplant Manager. After you define a test, run it on demand using the Run Now button on the Tests page. You can create a schedule to run the test at a specified time or at a certain interval. For each of these run options, specify how many instances of a test you want to run simultaneously (up to the number of Eggplant Functional licenses available). For detailed information about schedules, see Creating Test Schedules in Eggplant Manager. After a test finishes running, view the results on the Results page. Results are grouped by test, instance, and then script. You can find failures quickly and drill down to the necessary detail to determine the likely cause of failure. For more information about results, see Viewing Eggplant Manager Test Results. Agents: Agents run on the machines with the Eggplant Functional instances you use to run your tests. Note: The Eggplant Manager installation program installs and runs an agent on the machine with your Eggplant Manager server by default. For more information about agents, see Working with Agents. Eggplant Manager is fully integrated with Eggplant Automation Cloud, Eggplant's device reservation system. Eggplant Automation Cloud requires a separate license. If you are running both Eggplant Manager and Eggplant Automation Cloud, you can manage your tests and control access to your testing environment by using a single interface. For complete information about Eggplant Automation Cloud, see the Eggplant Automation Cloud documentation. Use Eggplant Manager from a supported browser on any computer with network access to the machine running the Eggplant Manager server, including mobile devices. 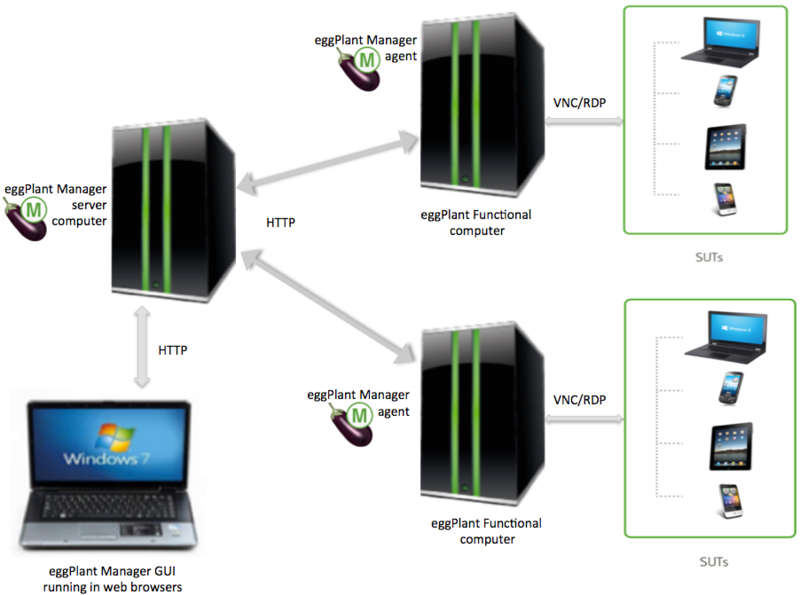 You need an Eggplant Manager agent running on each machine where you are using Eggplant Functional to run tests. Eggplant Manager communicates with its agents using HTTP. Eggplant Functional communicates with the systems under test (SUTs) using VNC or RDP. See Using the Eggplant Functional Connection List for more information about these connections.